Photograph of president-elect Franklin D. Roosevelt with the Queens Borough Public Library “book bus” in 1930. Caption on the back reads: “President elect Franklin D. Roosevelt inspects the Book-bus at the Executive Mansion in Albany and becomes a member of the Queens Borough Public Library.” Image and caption from the ALA Archives. Our new column features stories about how libraries celebrate their histories. From publications to parades, librarians have found many creative ways to mark their library’s milestones as cultural centers. We hope that the accounts here will inspire other libraries to commemorate their historical roles in their communities, and offer a pool of ideas for doing so. Editor’s Intro: Please take a moment to check out this terrific animated library history video by Erin Weaver. It leads the audience through a showcase of primary sources excerpts, couched in lots of color and movement, and makes for a very engaging experience! Ms. Weaver used Powtoon, an online animation tool, for the design. I liked how she not only tells the history of her library, but also recounts her own journey of discovery in compiling the primary sources for this historical mosaic. It’s quite inspiring to read about how this project lead to discoveries related to other public libraries’ histories in the region–and new connections with those sister libraries. Many thanks, Ms. Weaver, for sharing the story of how her library has “served as a community epicenter of art and knowledge and gathering.” Watch the video here and check out her background piece Deschutes History Write Up. 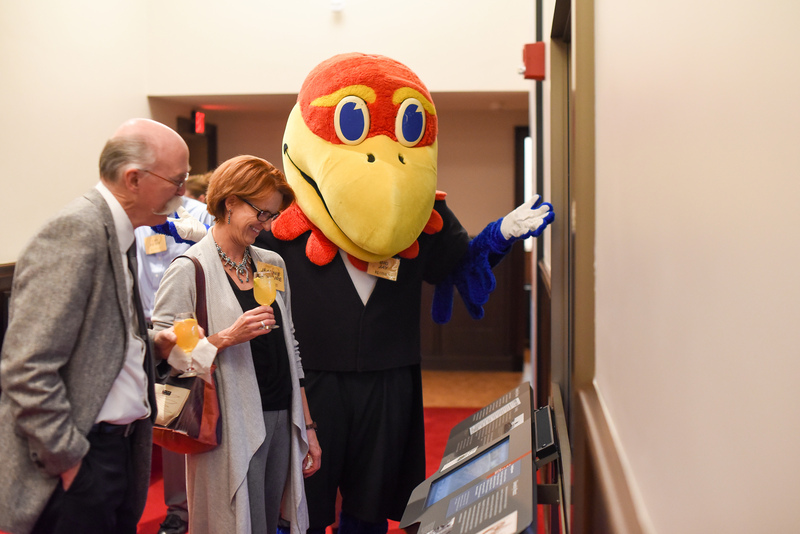 Editor’s Intro: You’ll find a trove of wonderful ideas for celebrating a library’s history in Ms. Hallstrom’s report about the golden anniversary of The Spencer Research Library at the University of Kansas. For this celebration, a team that included communications and design specialists as well as the library staff collaborated on two exhibits. Big Jay, the University’s mascot, joined the festivities and showed people around the exhibits. The group even created an exhibition catalog, available as a PDF, and it is a “must see” for library history enthusiasts! The Spencer Research Library demonstrates how a celebration of a library’s history can empower a library’s present: “An anniversary celebration is an excellent opportunity for libraries to engage new donors and thank existing donors for their years of support, while honoring the history of a library and highlighting its collections.” Read more about the Spencers, the library’s history, and the commemorative events in Ms. Hallstrom’s essay, KU Libraries: Kenneth Spencer Research Library celebrates 50 years. Big Jay shows visitors around the exhibit. 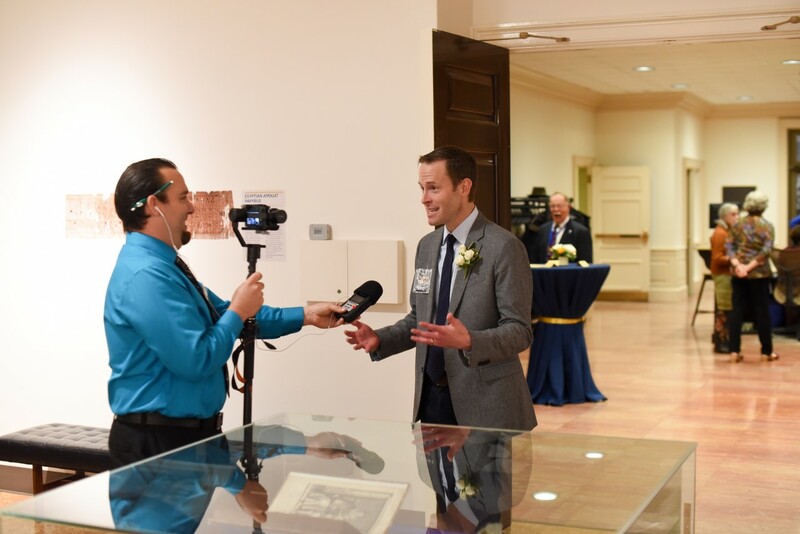 An event videographer interviewed people at the celebration. Author Bio: Janet DeVries Naughton is a Librarian and Associate Professor at Palm Beach State College. Previously she served as the Archivist for the Boynton Beach City Library and the Delray Beach Historical Society. She holds a Master’s degree in Library and Information Studies from Florida State University, and is completing a Master’s degree in History. She is the immediate past-president of the Boynton Beach Historical Society and is the author, co-author, or editor of ten local history books. Janet promotes historic scholarship volunteering as a tour guide in a historic Florida cemetery. Editor’s Intro: This post from Professor Janet DeVries Naughton provides us with an exceptional case study of library historiography. Academic Librarian Janet DeVries and Technology Librarian Graham Brunk lead a team of library history enthusiasts in Palm Beach County to create a book, Overdue in Paradise: The Library History of Palm Beach County, now available through Amazon, Target, and other major retailers. The book has been selected as a finalist by the Florida Authors and Publishers Association for their 2018 FAPA President’s Awards in the Florida/Non-Fiction category. Royalties go to The Palm Beach County Library Association and the Little Free Libraries of Lake Worth, Inc. The book includes all types of libraries in Palm Beach County. With ingenuity, the authors used Google Drive and Facebook to take a collaborative approach. Thirty-two people from around the county contributed to the project, and they crowdsourced the title of the book. Overdue in Paradise: The Library History of Palm Beach County book cover. Librarians, archivists, and support staff, led by academic librarian Janet DeVries Naughton and Technology Librarian Graham Brunk researched and wrote the 278-page book chronicling Palm Beach County’s library history. Replica of a “Property of the Lighthouse Establishment” bookplate. The 3” by 4 ½” label appeared in the front of books on loan from the United States Department of Commerce Lighthouse Service and distributed to government outposts via traveling library trunks beginning in the 1870s. The Jupiter light station dates to 1860 and is the oldest structure in Palm Beach County. The early library trunks helped pass the time at the lonely outposts and books mostly circulated among families and the few visitors (Bookplate Label, Courtesy of the Michigan Lighthouse Conservancy). Cataloging Supplies. The elegant Beinecke Medical Library at the Good Samaritan Medical Center began in 1968 with a gift from Richard Sperry Beinecke’s family. Beinecke served as a director of the Sperry and Hutchinson Company (S & H Green Stamp customer loyalty program) and as a Good Samaritan Hospital Association Board of Governors member. Although today’s medical library researchers use primarily electronic databases, the Georgian Revival Style facility retains its 1960s charm and elegance with a rare medical book collection, and much of its original furniture, including vintage dictionary stand, card catalog, and cataloging supplies (Private photo). Editor’s Intro: Here is another great report from the field. Hornell Public Library, NY recently celebrated its 150th anniversary. The events included a movie about the history of the library produced by local middle school students, which was surely a memorable learning experience for the students as well as an excellent way to preserve library history. Other parts of the commemoration included various web promotions, including digitizing a 1911 article and map about the library’s opening. Red Carpet Movie–From a Bookshelf to a Carnegie Library! 2017 Orange Public Library Board of Trustees at the Open House celebration. Author Bio: Lizeth Ramirez is an Archivist and Reference Librarian at the Orange Public Library & History Center. After working in various libraries in Orange County, she pursued the Master of Library and Information Science (MLIS) from San Jose State University, which she obtained in 2007. Lizeth is in charge of the local history collection at the Orange Public Library & History Center and works with the community to preserve their history. She has applied for and has been awarded two grants, the LSTA Pitch an Idea Grant in 2010 and the Latino Americans: 500 Years of History grant in 2015. Editor’s Intro: Ms. Ramirez shares details from a wonderful year-long library history celebration at the City of Orange Public Library. The 2017 celebration was influenced by the 55th anniversary celebration of the library in 1949. What a great idea–public libraries can look to their past celebrations for ideas for their celebrations today. Check out the commemorative card pictured in her essay; that’s a great way to help the community remember the history of its library’s services. It is also notable that commemorations at OPL include the branch libraries. Ms. Ramirez makes an excellent point in the conclusion about library history events: “The availability of funding can dictate the ways in which these are celebrated, which makes the involvement of library support groups very important. They can be asked to provide refreshments for events, fund the creation of booklets and pamphlets that celebrate library histories, or assist with tours and programs.” Library support groups, including the Board of Trustees, rallied in a very impressive way to mark OPL’s milestones. A photo of the teen winner of the Mount Prospect library card design contest. Author Bio: Carol Morency has a B.A. from North Central College in Naperville, Illinois. Before working in libraries, she wrote for various suburban Chicago newspapers as well as for an association of state government officials. She has also worked for the Downers Grove Park District and the Downers Grove Public Library. Her professional interests focus on social media, libraries as part of a spectrum of civic services, and uplifting the profile of libraries in general. A logo specifically designed for the anniversary. A designated web page www.mppl.org/75years to showcase photos from their archives and list celebration events. A four-themed approach: The Arts, Technology, Service, and Community. Each theme represents an opportunity that the library has offered its community over the years. A 75th Anniversary Art Exhibit with student artwork from 16 local schools. Over 1,600 people attended. A trivia game that included questions about the library’s history. As a child of the 1980s, my favorite event is the Eighties-themed scavenger hunt! A photo of local artist Duygu Kazkondu demonstrating the Ebru marbling painting technique at the February art show. Find out more from Ms. Morency’s essay here: Mount Prospect’s 75th Anniversary. Be sure to read about the dual committee structure that Mount Prospect created to mobilize the staff and community members for the events. Author Bio: Anya Berg is the Adult Services Librarian at the Palisades Free Library in Palisades, New York. She received her MSLIS from Drexel University in 2012, with a concentration in Archival Studies. Having held a position in an academic library and almost every department of a public library, Ms. Berg can confidently say she is interested in any and all things library related. Editor’s Intro: Wow! Exhibit panels, library history poetry, a video, big bubbles, a time capsule, and a commemorative booklet were all featured in a splendid celebration of the history of the Palisades Free Library! A committee of over twenty people, including many community volunteers, worked for nearly a year to organize the celebration–and that is quite a testimony to just how much Palisades values its library’s history. One of the purposes of this column is to provide inspiration and ideas to others planning library history celebrations, and Ms. Berg offers links to some wonderful sample materials in her post: Palisades Free Library Celebrates 125 Years. My favorite is the poem about the history of the library by Mildred Rippey. Be sure also to check out the video which explains the planning process and features photos from the commemoration!